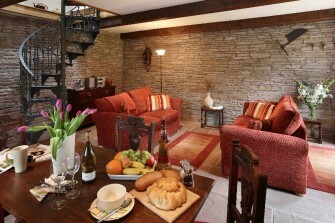 To refresh you after your journey each cottage has tea, coffee, milk, sugar and cakes ready for your arrival. 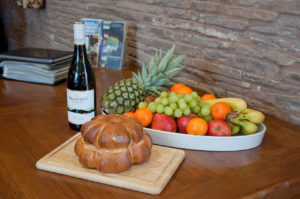 We like to be on site to greet you at the commencement of your holiday so please ensure we know your arrival time – call us or email, 01981 510238, leave a message if we are not able to answer. We ask that you arrive near 4pm. On day of departure, please vacate by 10 a.m. There may be some last minute flexibility regarding the above times, especially with short breaks, please ask us. Internet maps may show Holt Farm’s previous name ‘New House’ at this postcode. There are landlines for your use as mobile phone reception is variable. Mobile reception is available in various places outdoors. Free Wireless Internet is available in each cottage, we kindly ask that your dwonloads/usage is modest. 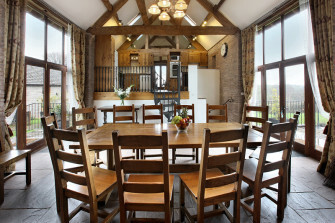 Holt Farm Wain House is fully accessible for less able visitors and wheel chair users. We have additional raised toilet seat with arm rests and a free-standing and wall mounted shower seat in the wet room. Children’s Items We have wooden cots, travel cots, highchairs, booster seat, stair gate and children’s plates, mugs and cutlery. Comprehensive Local information Leaflets are in each cottage, as well as maps and local walking routes. More can be accessed from our Walking World subscription. 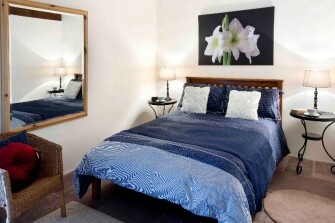 For your comfort we supply the following items and services in all cottages. All heating (underfloor and radiators) and electricity and logs for the wood-burners in Holt Barn and Holt Farm House. Gas hob, electric oven, fridge freezer, microwave, dishwasher, washing machine and drier, a generous supply of crockery, glass wear, cooking utensils, serving dishes and cutlery. 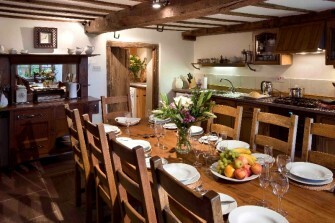 A pack of children’s plates, bowls, cutlery, mugs is in each cottage. All bed linen, mainly pure cotton sheets and duvet covers, 10tog duvets, [some feather, some man-made content], top sheet and blankets available upon request. Large flat screen televisions, Freeview, DVD player, stereos with ipod docks, selection of DVD’s, board games, puzzles, books, toy box. Please ask if there is something we have missed out!